Can Facebook influence an election? It depends on you who ask. If you ask former president Barack Obama, he might say yes. After Donald Trump won the presidency, nine days after Mark Zuckerberg dismissed the idea that fake news on his platform influenced the election, Obama, who believed the strong impact of fake news, advised the young CEO to assuage the spread of false news on his social media network. If you ask Max Read, a New York Magazine journalist, if Facebook can influence an election, he too would agree, citing misinformation’s effect on voters’ perspectives. Of course, no one can know for certain whether Facebook alone can change the outcome of the election. Other strategic choices, such as campaigning at the right states and using the right polling data, can affect a candidate’s success. Nevertheless, campaigning is an important part of winning a political position, and where and how you campaign adds an even heavier weight on the outcome. For Read, and maybe for Obama, fake news helped Trump win the presidency. But can Facebook ads, particularly, influence an election? Can it propel candidates to their coveted political positions? For the purpose of this experiment, let’s say it could. Let’s assume Facebook ads alone could affect election results. 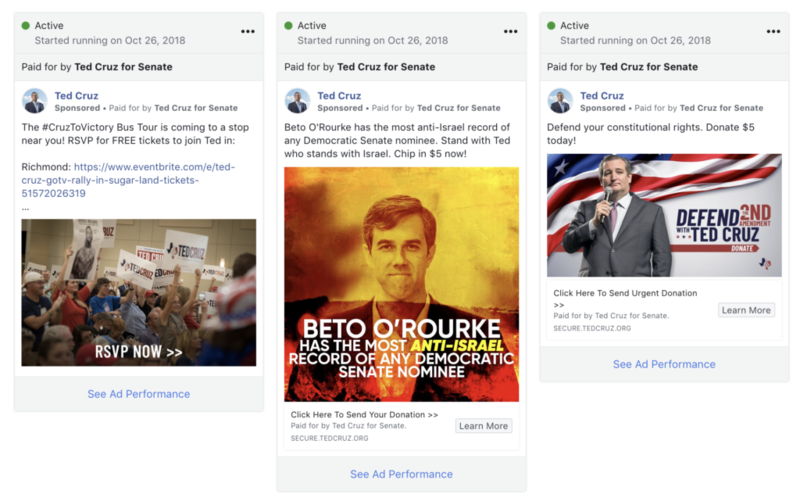 In this experiment, I’m predicting the next senator of Texas by analyzing the October Facebook ad campaigns of the candidates Ted Cruz and Beto O’Rourke. The candidate with the highest-rated political campaign will be the predicted winner. I’ll rate, from a score of one to five, their campaigns according to the following criteria: spend, variety of ad creatives, media, ad copy, variety of ad formats, and clear objectives. The higher the spend, the better campaigns will perform for several reasons. One, the higher the budget, the more resources available to A/B test ads. A/B testing is an important part of advertising because it allows the candidates to run the best performing ads, which cost less. Second, Facebook advertising is an auction in which the candidates must bid higher than their competitors’ to win a spot on Facebook’s feed. Third, a bigger budget allows them to scale campaigns. O’Rourke is spending significantly more than his Republican opponent, Cruz, likely because Cruz is investing heavily on other platforms, like TV or radio. But I’m not here to judge other platforms. I’m here to judge Facebook ads. Since O’Rourke has a budget large enough to A/B test constantly, bid higher in auctions, and scale campaigns, he receives a five out of five. Although Cruz has a lower score, a six-figure budget is ideal for a serious campaign. I also award him a five out of five. Refreshing your creatives can significantly improve campaign performance. 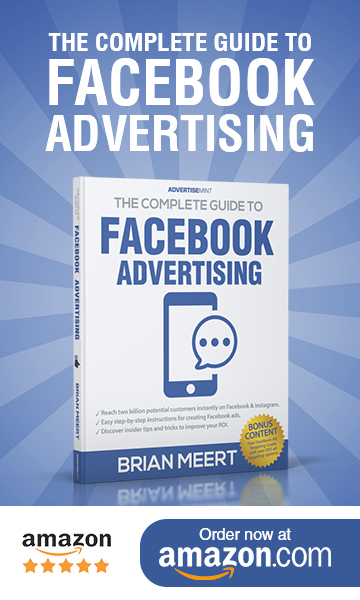 Refreshing ads every two weeks, as Facebook suggests, will keep the audience interested. Neglect to do so, and the audience will experience ad fatigue. To determine whether the candidates have good ad variety, I peeked into the number of ads they run to date. While O’Rourke runs 7,504 ads, Cruz runs 344. Cruz has a significantly smaller number of ads likely because of his smaller budget. As mentioned, the bigger the budget, the more resources to A/B test and scale, which both require creating new ads. Scrolling through both candidate’s ad archives, I find O’Rourke has more ad variety. He runs ads of different formats, media, video sizes, and objectives. Some videos show him speaking in front of the camera, while others feature homemade square videos of supporters encouraging Americans to vote. Some ads feature interviews, while others feature images of his campaign volunteers. Cruz has less ad variety. Most of his campaigns are professionally edited horizontal videos and images, either featuring him or his opponent. Much of his creatives are similar with a slight copy or image variation. Cruz’s ads are mostly horizontal images and videos, with one or two square images. Media occupies a significant part of ads and determine whether users will stop mid-scroll on their feeds. If using images, they must be crisp, clear, and attractive. If using videos, they must be short and vertical with subtitles underneath for sound-off viewers. O’Rourke’s campaign consists of a few square videos and numerous horizontal videos, some with subtitles. O’Rourke has no vertical videos, a major disadvantage. Because the vertical format fills an entire phone screen, it’s ideal for attracting and arresting the attention of mobile users. O’Rourke’s videos are also longer than the recommended maximum of 30 seconds. The videos run from 44 seconds to one minute, not the recommended length. While some of his videos are reposts of news snippets and clips of him speaking directly to his audience, a large bulk of his videos are unedited, personalized videos by his supporters, lending a look of authenticity. This is advantageous to his campaign because most people on Facebook prefer amateur videos taken by regular users than professionally edited videos taken by an organization. O’Rourke’s ads feature supporters in horizontal videos. Ted Cruz, too, runs both video and image ads. 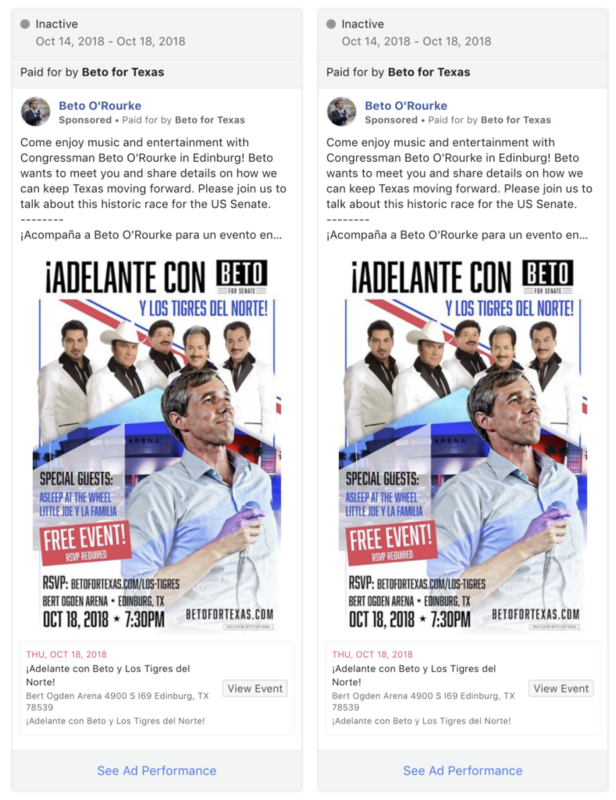 Unlike O’Rourke, his video and image ads are all in the horizontal format (except for one vertical video ad), a format least recommended by advertisers. However, where Cruz fails, he makes up for his video length, which all follow the recommended 30-second maximum. Unfortunately, some of his videos don’t have captions, a major disadvantage, as most users watch videos with sound off. Cruz’s videos, reminiscent of a TV commercial, are all professionally edited, which may repel users. Although the ad’s media receives the most attention, the copy should still be well crafted. Good copies are short, readable, complementary to the media, and concisely delivers the main message. O’Rourke’s copies are mostly long, with no line breaks or emojis, making the ad appear unorganized, cumbersome, and messy. Because the copies are long, some readers may find the ad too wordy, too intimidating to read. Additionally, part of the message is truncated because the length is too long. Some of the copies have Spanish versions, allowing his message to reach the Spanish-speaking community. O’Rourke copies are long. Some have Spanish versions. Ted Cruz’s copies are short, taking up three to four lines. The copies also feature emojis to attract the eye and add visual appeal. The line breaks separate paragraphs, making the copy look readable, clean, and well-organized. Some of the ad copies also have Spanish variations to appeal to the Spanish-speaking community. Using different ad formats reduces ad fatigue. Although image and video ads are the most used formats, other formats exist, such as Instant Experience, Carousel, and Slideshow. 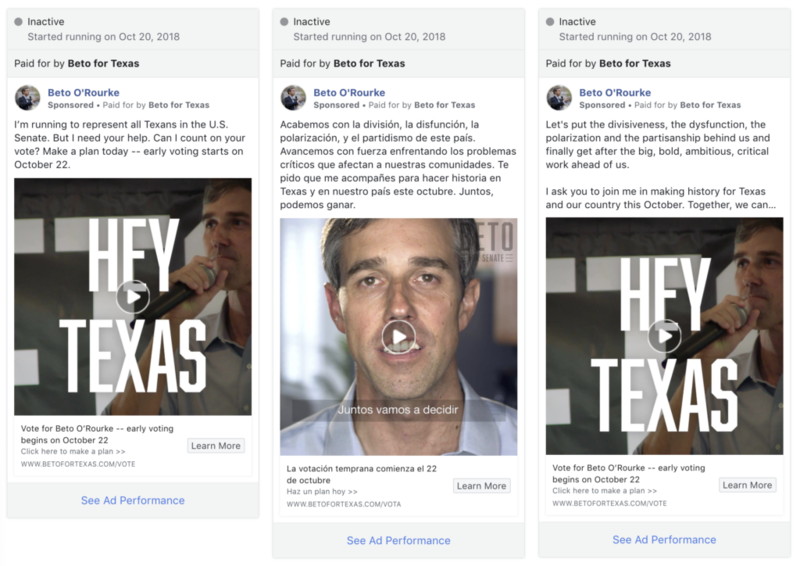 O’Rourke’s campaign consists of images and videos, with few carousel ads. Cruz’s campaign consists of image ads, video ads, and one carousel ad. Both candidates don’t have a large variety of ad formats. However, O’Rourke has more advantage over Cruz because his video ads are a combination of square and horizontal while Cruz only has horizontal videos, save one or two square videos. A campaign can’t perform well if it doesn’t have a clear objective. Before these candidates can start a campaign on Facebook, they must first clearly understand their campaign goals. Do they want to increase donations? Do they want supporters to understand their stances or do they want them to join a local event? The objective dictates which ad format to use and appears in the copy, the media, and the call-to-action button. O’Rourke matches event objective with “view event” CTA. In contrast, Cruz’s campaign, although also focusing on awareness, concentrates on donations. To raise awareness, he runs image ads featuring himself, his name, and his opponent’s stances on issues in the copy. He also runs video ads that center on O’Rourke, discussing his stances while images of him appear on screen. Unlike O’Rourke, Cruz spends no time speaking about himself and his beliefs and, instead, focuses on his opponent, O’Rourke. To increase donations, Cruz runs image ads featuring his portrait, short copies, and a “learn more” CTA, an odd choice compared to O’Rourke’s “donate now” CTA. Cruz’s objectives are not as clear as his opponent’s, since, instead of raising awareness on himself, he raises awareness on his opponents. Instead of giving a clear CTA for donations, he uses a “learn more” CTA that is better suited for an awareness ad. Cruz matches donation ads with “learn more” CTA. O’Rourke wins by 3 points. Because his Facebook ad campaign bests Cruz’s, he is the predicted winner of this year’s election for the Senator of Texas. 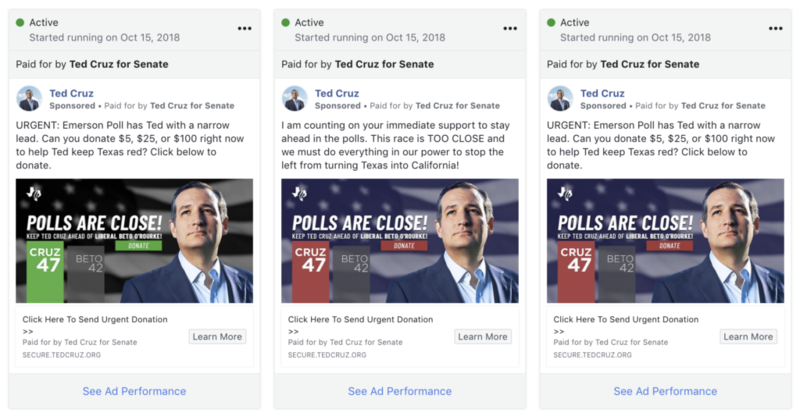 Can Facebook Ads Influence an Election? You may not be convinced that a social media platform can affect the outcome of elections. You may side with the critics who argue that to win elections, each candidate must make the right strategic choices, such as referencing the right polling data and campaigning at the right cities or states. You may also side with this research that asserts campaign outreach has zero effect on voters. No matter your stance, take this experiment with a grain of salt because it is simply that, an experiment. Also, recall that in this experiment, we assume that Facebook ads alone can affect elections outcomes. If results reveal Cruz to be the winner, you can dismiss this experiment as amateurish, akin to the World Cup predictions of Paul the Octopus. If O’Rourke emerges the winner, well, perhaps Facebook ads have at least a little bit of influence after all.